Hello Saga Anderson! Thanks so much for taking the time to answer some questions for our readers. 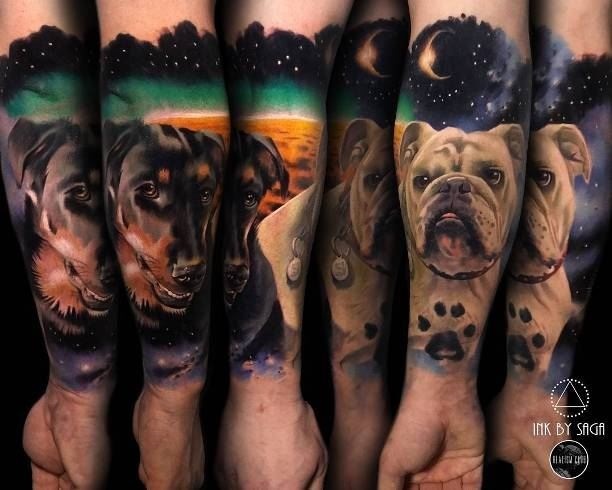 Please start by telling us something about yourself and what inspired you to start tattooing? There is definitely a tough learning curve when first starting to tattoo, and the first few years at a shop required a lot of self-directed learning and countless drawing hours. Learning the realism technique and the specific requirements of this style versus other styles was a second learning step I decided to take, and required even more time, patience, and self-directed study. My natural drawing style is cartoon/illustrative, so it was quite a shift for me after 3 decades of drawing with lines. Q: Was it hard to learn the basic skills of tattooing? Did you apprentice? A: I didn't do an apprenticeship though, after hanging out in a shop in the late 2000s where my girlfriend at the time was tattooing, I got my first sense of how the process worked. I was lucky enough to have taught myself enough basic skills while practicing on myself and friends over the next few years while studying in university to get into a shop afterwards and really start honing my skills. I definitely don't recommend this route into the industry for anyone thinking of becoming a tattoo artist, I think I was one of the lucky few who found success in this industry without a mentor. Q: Your tattoo style is very unique. 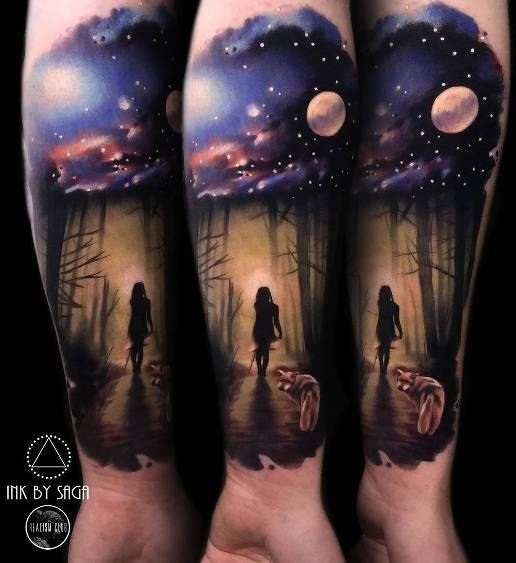 Deep shadows and brilliant highlights are something I can see in every tattoo, especially the color ones... Amazing! How has your style developed throughout the years of experience? A: Thanks so much! I really try to incorporate elements of color and value theory in all my work, I find contrast and depth with values crucial to making a vibrant tattoo that isn't flat or washed out on the skin. You might not guess it now but color was one of the things I always struggled with, and was always fascinated by how simple color transitions can transform a tattoo from flat to visually vibrant. Over the years my style went from focusing on line weights, black and grey, geometric elements, and many small details, to no lines, the full color spectrum, and the focus on large-scale, less detailed painterly work. 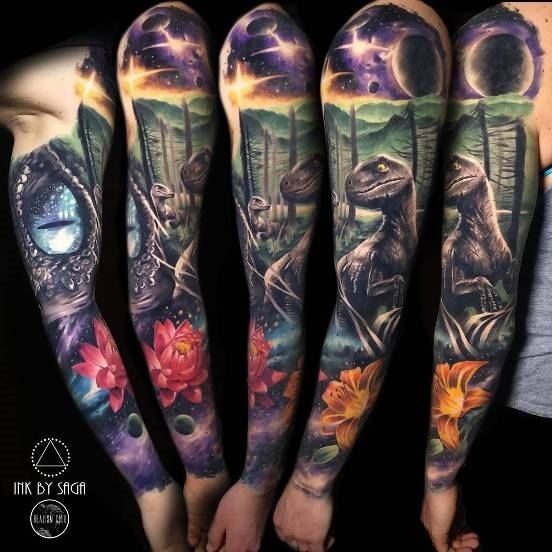 I tell myself over and over to reduce detail, to simplify my designs, to be more unique, to find more ways to incorporate contrasting elements clearly, and to make my work look more like a piece of fine art on skin rather than a tattoo...these are the guiding principles that I use to continue to develop my approach. 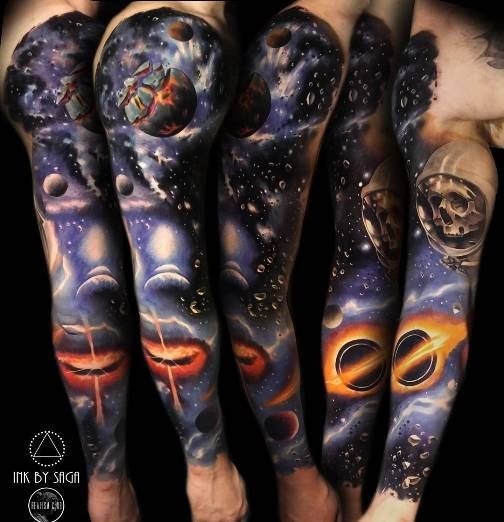 Q: The cosmos and its beautiful chaotic creations... Ahh such an inspiration. 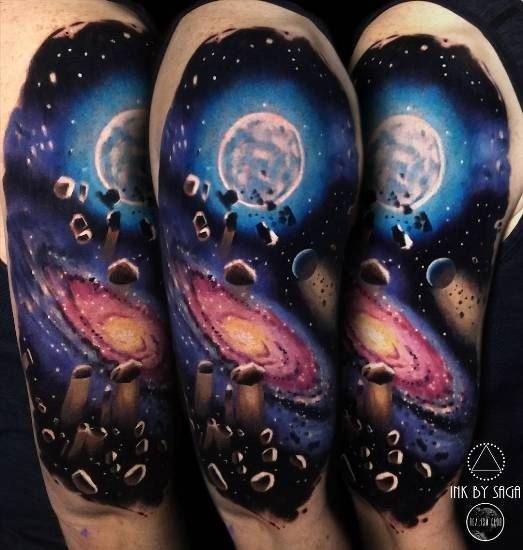 I guess no one can do cooler Cosmo inspired tattoos like you. Do you work by some certain images or the final result is a spontaneous inspiration? Guide me a bit. A: Too kind! Space, science, and the universe are some of my main passions and inspirations, so I'm always super happy when I get to tattoo cosmic work. 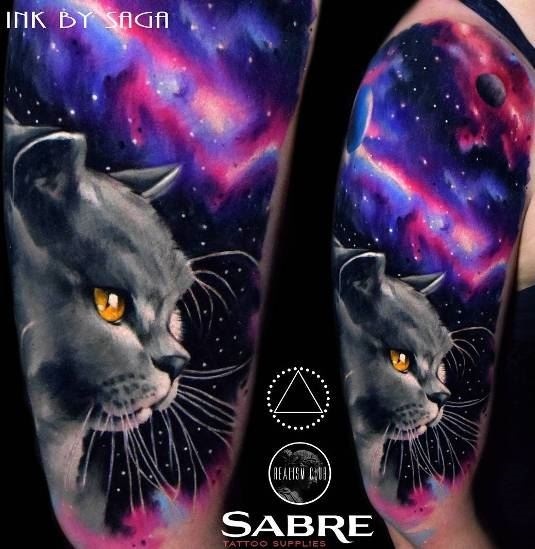 I create the basis for all my work digitally, combining many references into one unique composition, which I do the day of the tattoo using guidance from the client and the shape of their body, which is paramount. Realism works better if it fits the body as it moves, so I need my clients with me as I design to ensure a custom fit. Once I see the body part an image comes into my head and I create the design based around my vision. 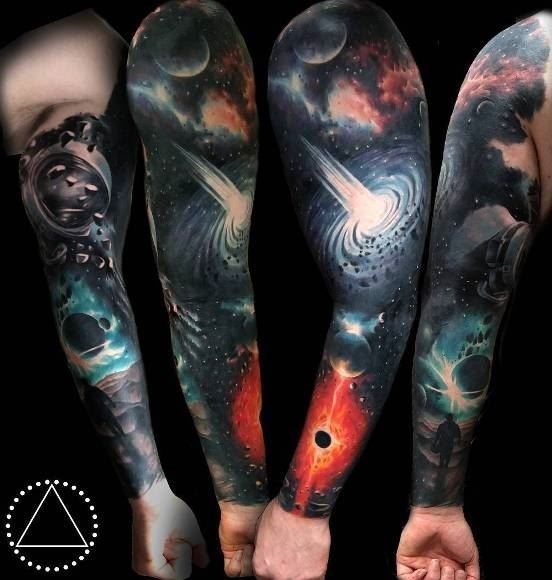 For space tattoos I often don't always follow the set design however and modify as needed as I go, as I find much cosmic inspiration comes to me only as I'm tattooing. I'm lucky enough to have clients that trust my approach and let me do what I want with their project, feel pretty lucky! 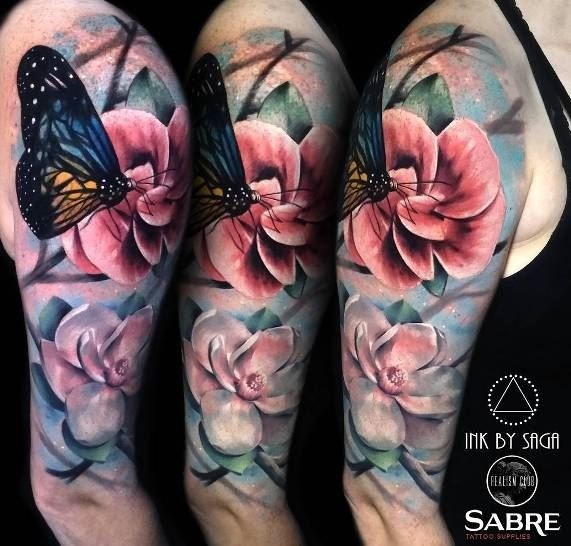 Q: The color tattoos are probably the most eye-catching designs in your portfolio. 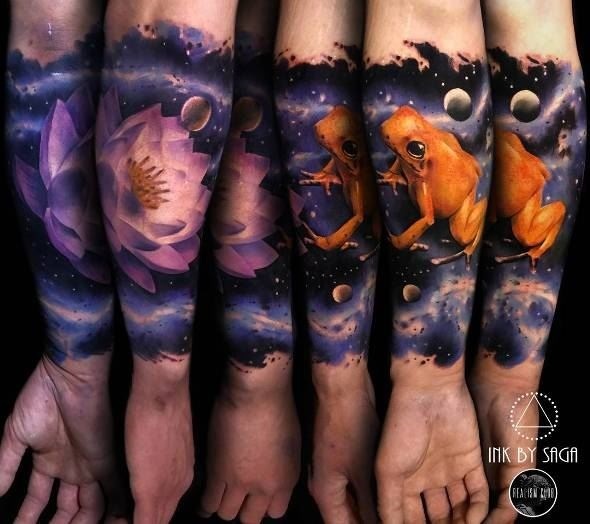 Do you prefer some color ink brand to make it so nice or it's all about technique and knowledge of the tattoo process? A: Color tattoos are my passion! While I do enjoy working on monochromatic pieces occasionally my focus is definitely on color, I find there is so much more I can express using the the myriad colors can exist. 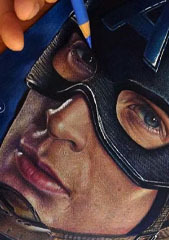 Knowledge of tattooing color is an essential requirement for doing color work; there are many unique challenges that don't occur in B&G work, so any artist doing color work needs to know what makes it different and the steps needed to achieve a strong color piece. I use Fusion ink exclusively, both their muted and bright tones are perfect for my style of realism and fit my work perfectly. Q: How much 3 D technique plays a big role in making brilliant highlights? A: For me techniques that enhance depth and give the illusions of 3 dimensions require correct use of color value, and it's nearly impossible to achieve a 3 dimensional illusion on a 2 dimensional surface without the use of both highlights and 'lowlights'. This applies to both color and grey work; without the judicious use of the lightest and darkest values everything ends up midtones and there is a lack of depth to the image. Q: I can see some really cool mixed designs, like portraits and Cosmo inspired themes... just wow! Are those designs your own creations or your clients are super creative? :)) Tell me a bit about your connection between you and your clients. A: Haha yes I've definitely had some interesting cosmic mash-ups, so much fun! For me the cosmic theme can be applied to anything one can think of, so I'm super open when clients suggest adding into a pet portrait or landscape. I usually leave it to my clients to choose the style of background of mine they'd prefer, whether cosmic, painterly, nature, out of focus elements, heavy black, water, electricity, etc. So normally we'd have a piece booked and the client will come in and say, "I know we were going to do my dog's portrait but your space work just grabbed me, can we put a helmet on him and put him in space?" I'm always up for it! Space is infinite and there are an infinite ways to create it artistically. A: Space, the cosmos, and physics play a huge role in my life and the way I perceive the universe, so it's exciting to be able to add these elements into my work. This definitely comes from a science-based view more than any kind of spiritual influence. I did 9 years of university before leaving it all behind to get into tattooing so my science education comes into play a lot. Quantum physics and relativity are for me the great mysteries of life, and I spend much of my spare time learning as much on these subjects as possible. The study of particle physics leads naturally into the study of optics and color theory, which is of great advantage to any artist working in visual mediums. Realism itself to me is a very scientific technique that can be quantified, improved upon, and measured, so fits my worldview quite well. Q: Where are you located now? 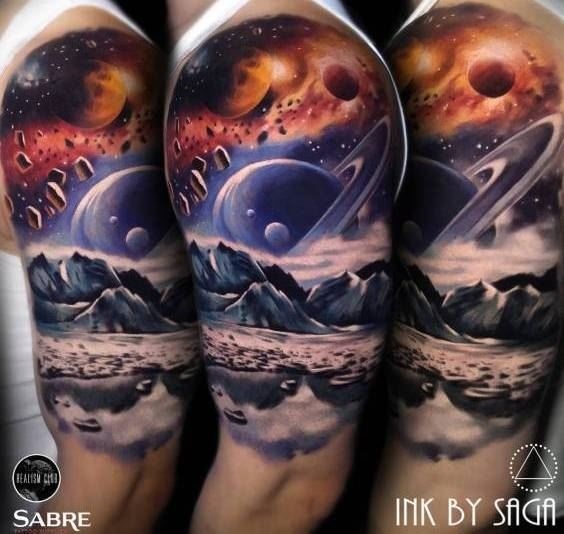 A: I'm currently based in Calgary, Alberta, Canada, at Boss Tattoos, a rad collective of independent tattoo artists. Calgary is in the Canadian West at the foothills of the Rocky Mountains. I do conventions and travel much of the year so am on the road a lot across Canada, the US, and Europe. 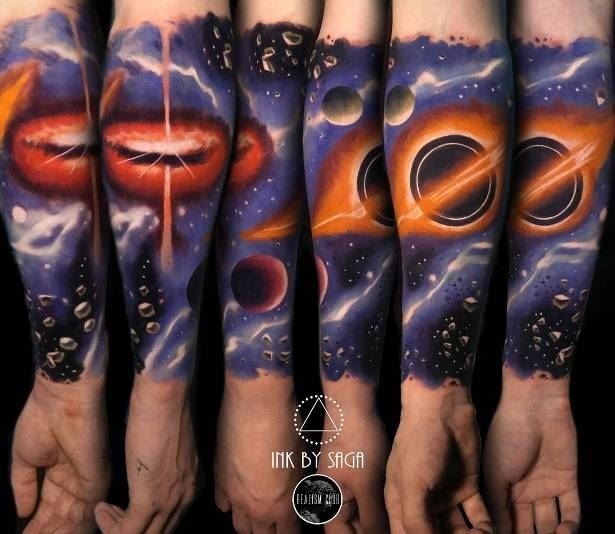 The best way to reach me is through my website at www.inkbysaga.com or by email at rollingbass@hotmail.com. 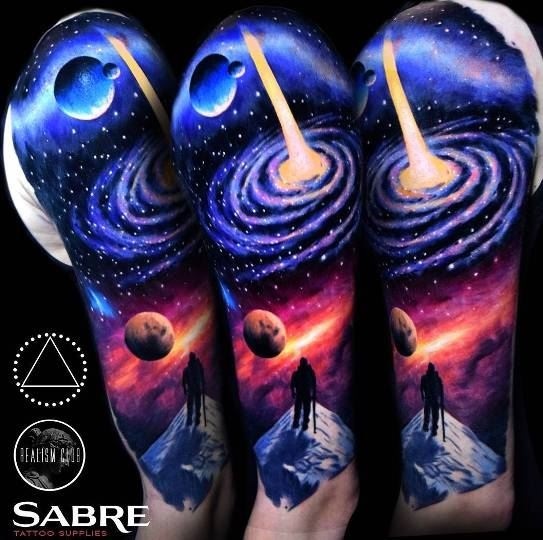 Q: Saga, after so many tattoos done, all brilliant, recognizable by the style you developed (I can immediately point out oh, that's Saga's tattoo by just looking at) would you try something different? A: Yes I hear that a lot! Everyone says they can spot one of mine out in a crowd, definitely something I'm always happy to hear. With so many amazing artists out there these days for people to choose from it's always a benefit for every artist to try to develop their own unique approach...and so much fun to take art in a weird direction! I started off for my first few years at a busy street shop so used to tackle every style to some degree, but after falling in love with the realism technique I slowly dropped other styles, focusing solely on realism now and into the future. I feel I have so much still to learn in realism and color theory that it will keep me occupied for years to come. Q: What are some of the most important thing that every professional tattoo artist must know? A: Keep learning and trying new techniques and products! We're in an exciting time in the tattoo industry, at last we're getting dedicated companies to make products and equipment specifically for us instead of borrowing everything from other fields. It's easier now than ever to use the internet to find info and see the latest techniques and work from around the world, to do conventions, to visit museums, to seek out new art approaches and artists that know more than us to learn from. Use these resources! Q: Any plans for the near feature? A: I'm currently expanding a tattoo collective I helped create called the Realism Club, with the goal of continuing our shared learning together while travelling the world. I've also been and will be continuing to tour heavy most of the next few years to further my own learning, as I've been lucky enough to nab a few supportive sponsors this year who've invited me on some fun adventures with some crazy talented artists! One of the funnest interviews I've done, loved the questions.